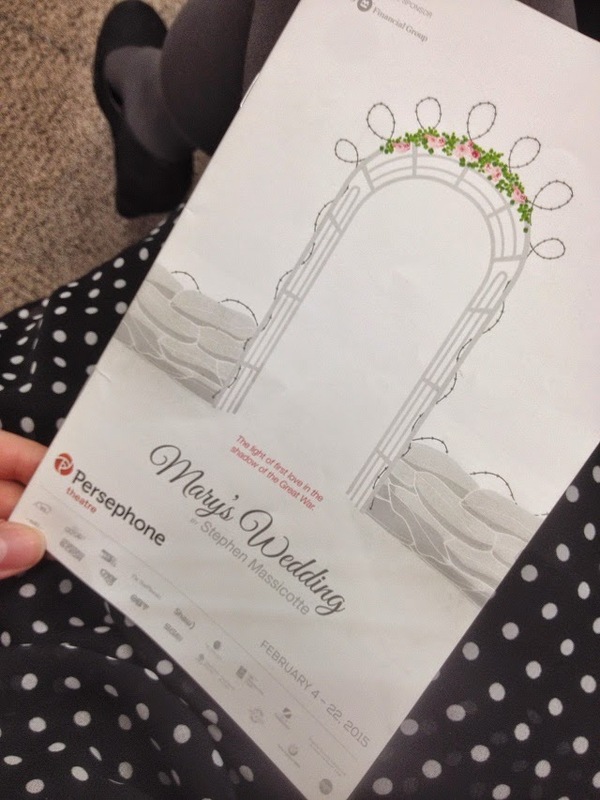 On Sunday I went to Mary's Wedding at the Persephone Theatre. My good friend Jackie played Mary so I was really happy to be able to see this play, although I left it right to the end - it was the final show! The play takes place the night before Mary's wedding in a dream. It's about herself and Charlie, who meet and find love while seeking refuge from a sudden storm. Her dream is about her time with him and the trenches of the Great War, with the transition between the two being perfectly seamless. I really enjoyed Mary's Wedding. I don't typically enjoy anything to do with war, but the way that this play comes in and out of reality, mixing events that did happen or at least could have happened with others that definitely couldn't have - such as Mary speaking through her love's sergeant while still in her nightgown - just made it flow so seamlessly that it kept moving from one setting to the next. Overall, I am glad I went and the cast and crew did a wonderful job! Have you been to any plays or productions recently? I haven't been to any productions lately, but I live about an hour from Barter Theatre, so I should take advantage of that :) You are so sweet to go support your friend!